MANILA (UPDATED) - President Rodrigo Duterte on Friday revealed that China warned his administration of war if Manila will insist on its ownership of areas in the disputed South China Sea. Duterte said the Chinese side issued the warning after he expressed the Philippines' intent to drill oil in the resource-rich waters. It was initially unclear in the president’s speech who issued the warning and when. But Duterte said at the latter part of his speech that he asserted the Philippines' right to its exclusive economic zone in the West Philippine Sea to Chinese President Xi Jinping. The president held bilateral talks with Xi on the sidelines of the Belt and Road Forum for International Cooperation last week. China's military is one of the world's most powerful. Duterte, appearing to be sharing the details of his talks with Xi, said the Chinese leader insisted that China has “historical” ownership of the disputed sea that can be traced back to the Ming Dynasty, but the Filipino leader shot back by saying such a claim is “alien” to Filipinos. “Pinaga-awayan natin, ‘akin ito’. Sabi mo, ‘iyo ‘yan.’ Eh sabi ko, ‘atin ito, I’ll drill the oil.’ Sabi niya, ‘please do not do that because that is ours.’ ‘That is according to you.’ ‘But I have the arbitral.’ ‘Yes, but ours is historical and yours is legal of recent memory,’” Duterte said. 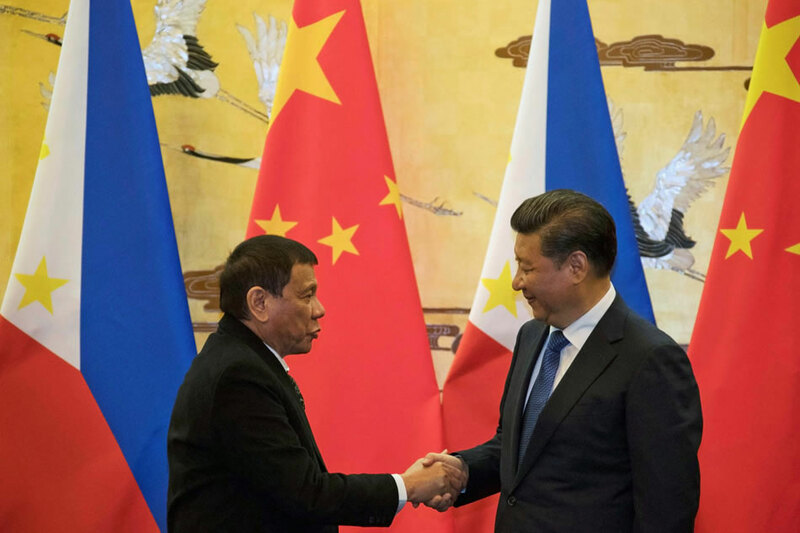 Duterte said the threat of an armed confrontation with China is the reason why he has chosen to pursue friendly relations with the Asian giant, instead of being adversarial. He said the Philippines will lose against China if the two countries declare war with each other. He also doubts that any country, even treaty ally U.S., would come to the Philippines’ help. “Are they willing to fight? Because if they are willing to fight, we are. But kung ako lang, why would I do that? It will result in a massacre and it will just destroy everything. Ang unang sasabog diyan ‘yung Palawan,” he said. Duterte revealed the details of his supposed talks with Xi in response to criticisms by former Foreign Affairs Secretary Albert Del Rosario and Supreme Court Senior Associate Justice Antonio Carpio. Del Rosario and Carpio led the Philippines’ legal team in its arbitration case against China. In July last year, a Hague-based arbitral tribunal handed the Philippines a landmark arbitral victory against China, as the United Nations-backed court invalidated Beijing's sweeping nine-dash line claim over the disputed waters. The two have criticized the Duterte administration's China policy. Duterte also blamed the Aquino administration and the U.S. for not allegedly doing enough to prevent China from building artificial islands in the Spratlys archipelago in the South China Sea. “Ito sila Del Rosario and the rest of the guy, itong lahat na, magdadaldal lang, where were they? If it was really ours in the beginning, it was really ours. That’s why we went to the international arbitration court,” Duterte said. The President made this claim just as representatives from the the Philippines and China met Friday in Guiyang, China for inaugural bilateral discussions on the dispute. The Association of Southeast Asian Nations (ASEAN) and China have also finished drafting the framework for the code of conduct in the South China Sea. The binding code of conduct, which shall replace the non-binding 2002 Declaration on the Conduct of Parties in the South China Sea, will lay down the rules for all claimant states. Since assuming the presidency, Duterte has pursued warmer ties with Beijing despite the sea dispute, aiming to boost economic ties with one of the world's largest economies. At his ASEAN debut hosting, the concluding leaders' statement was silent on China's militarization and island-building activities in the South China Sea. The statement also did not mention the Philippines' landmark arbitral victory over China. Four ASEAN members- the Philippines, Vietnam, Malaysia and Brunei- have partial claims in the resource-rich waters, overlapping with China's sweeping claims.